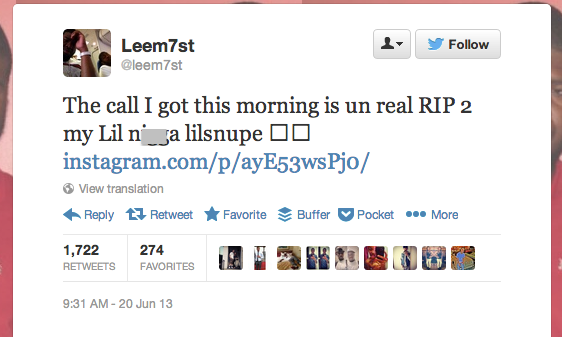 Up-and-coming rapper Lil Snupe was killed in Louisiana Thursday morning, shot twice in the torso. Winnifield City Police responded to calls of a shooting around 4 a.m., where they found the 18-year-old rapper mortally wounded. Winn Parish Coroner investigators pronounced him dead at the scene. Little is known so far about the case, but police said they were working to establish a motive and "are currently in search of a person of interest, who is unnamed at this time." 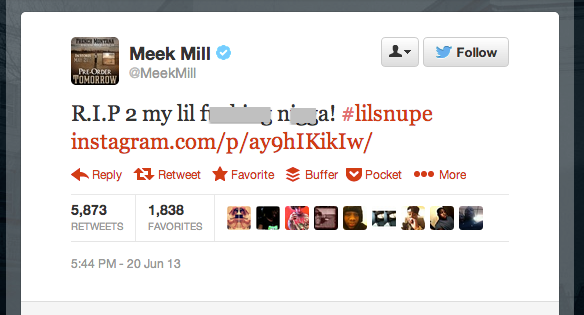 Lil Snupe, born Addarren Ross, was signed last year after handing his demo of Meek Mills, who signed him almost immediately to his MMG imprint Dream Chasers. R.I.P @LilSnupe tears coming dn my eyes snupe is a amazing friend artist I cnt believe ths!sending my prays 2 his family & his DCR family!